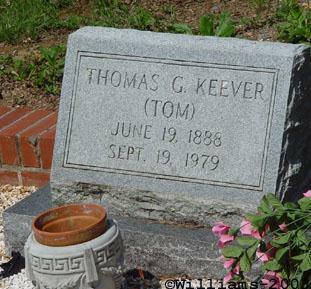 Thomas Garson Keever, son of Jonas Ausburne Keever and Mary Jane Baker, husband of Francis "Fannie" Knight. 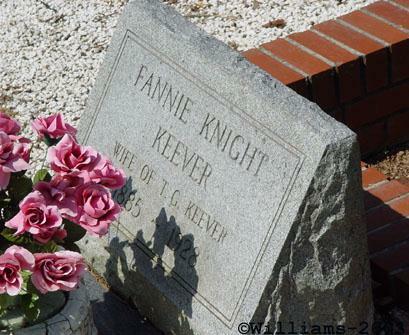 Francis "Fannie" Knight, daughter of John Tedford Knight and Mary C. Young, wife of Thomas Garson Keever. Tom Keever, age 91, of Route 6, Cartersville, died Tuesday night, September 18, 1979, at the local hospital following an extended illness. 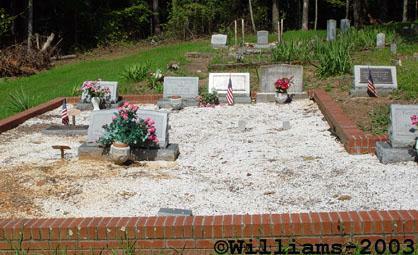 Survivors include four daughters, Mrs. Bessie Brooks, Ft. Worth, Texas; Mrs. Sallie Angle, Cedar Bluff, Alabama; Mrs. Fay Etheridge, Dalton; Mrs. Charlatene Woodward LaFayette; two sons, Edwin and William, both of Cartersville; one sister, Mrs. Lula Gramblin of White; 10 grandchildren, a number of great-grandchildren and a host of nieces and nephews. Graveside services were conducted Friday at 2 p.m. from the old Macedonia Cemetery with the Revs Tom Bill Blackburn and Nat Abernathy officiating.